This recording is a document of electroacoustic music performed live at Oblò in Lausanne, Switzerland, the 5th of March 2009. 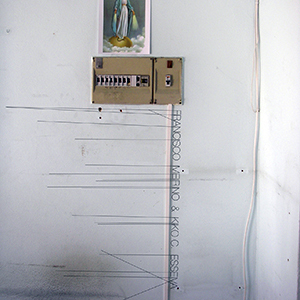 Performed by Francisco Meirino (computer & contact microphones) & Kiko C. Esseiva (tape recorders & real-time tape manipulation). Mixing, mastering and graphic artwork by Francisco Meirino. No overdubs. A much more recent recording (than Clara Nostra by If, Bwana), from March this year, is by Francesco Meirino (sometimes known as Phroq) and Kiko C. Esseiva. The latter plays ‘tape recorders and realtime tape manipulations’, whereas the first does ‘computer and contact microphones’, which they call electro acoustic music, here captured in concert. One piece of forty minutes of quite ‘present’ electro-acoustic music, with a strong love of ‘continuos’ sounds. It’s not easy to describe what’s going on on this release. The sweeping sounds of tapes, crackles and hum of the computer and contact microphones make music that is quite dense, but also a true delight to hear. Mysterious, dark, intense, but also delicate and precise. Improvised but almost sounding composed, save a for a few moments here and there. An excellent work. Pretty intense music.